Jon Moore - Bespoke, hand crafted, individually designed clothing for the contemporary woman. In 2016 I ran my first UK sewing course in collaboration with Jayne Edwards at her beautiful country home, Gaddens Manor in The New Forest, England; they have proved to be a huge success! For the past 12 years I have been teaching Residential Couture Sewing Courses in Palm Springs, California with Claire Shaeffer and in North Bay, Ontario with Kathryn Brenne, so now it is wonderful to be able to do this so successfully so much closer to home! In 2019 Jayne and I plan to offer four courses. Come and enjoy a sewing holiday with like-minded sewers. You will have the unique opportunity to study with me, a Couturier with over 35 years experience, in a class of no more than 8 students, in beautiful and relaxing surroundings. The 5 day workshops will begin with a traditional English afternoon tea at 4.00 pm on the Sunday followed by a light supper that evening. You will have the opportunity to meet me, Jayne and all the other students. Classes will then run from 9am to 5:00pm Monday to Friday. This class explores a pure Couture technique, "Double Face". A classic double face is woven together, so that it can be "split" and turned in on itself. This creates a totally reversible jacket, which looks identical inside and out! I have designed this easy, raglan-sleeved jacket with feature pockets, which involve a shaped, piped opening and are silk lined. The jacket is finished with hand stitching in pure silk, buttonhole twist. I have once again collaborated with a top London Fabric House to supply a beautiful light, double face wool crepe, which is available in over 30 fabulous colours. 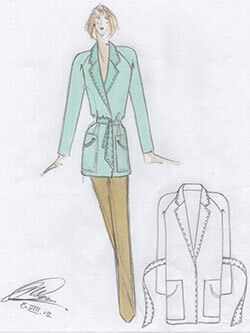 The course will cover, pin marking a couture pattern, trace tacking and pad stitching a tailored collar. Making a couture pocket and working with double face fabric, hand topstitching and so much more. For the last two years, I have run a very successful Body Double Course at Gaddens Manor and we now have quite a few students with their own dress stands. This course is open to anyone with their own personal dress stand. Essentially this is a draping class, in which you will drape your own dress directly onto your own stand and in pure Couture style create a dress! There is no pattern; you will create that directly in the wool crepe as you work. 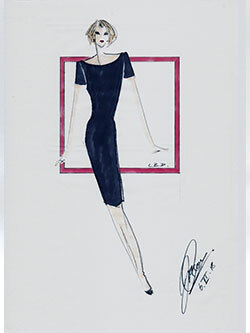 The dress will have a fitted body with any style of neckline you like to create, with either a short or 3/4 length sleeve. I have once again collaborated with a top London Fabric House to supply a beautiful light weight wool crepe available in over 50 fabulous colours to make this dress, so it is a LBD but in any colour you like!! The course will cover, draping on the stand in fashion fabric, trace tacking, backing with silk georgette, lining in silk satin and all the hand finishes to create this classic Couture dress. Kathryn Brenne is a graduate of Ryerson University's Fashion Design program. Ryerson is regarded as the top school for Fashion Design in Canada. She is a best selling Vogue pattern designer, teacher, contributing editor to Vogue Pattern/Sew Today magazine and writer for the on line fabric retailer Emma One Sock. One of the industry's most prolific writers, Kathryn has written over 200 articles for Vogue Pattern magazine, Sew Today, THREADS, Butterick Home Catalogue, Consumers Digest and Sew News. She has appeared in two episodes of Sew Much More on Home & Garden Television (HGTV). With her extensive knowledge of fabrics and sewing techniques Kathryn is a popular instructor at various workshops across Canada, the US and most recently England. 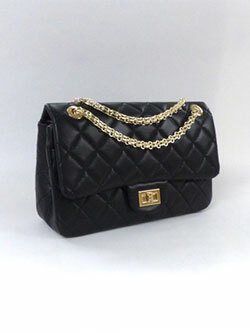 The Classic Quilted Handbag has become a recognized status symbol since its inception in 1955. Designed by a famous French designer this versatile handbag is the perfect accessory for jeans and a quilted French jacket or evening wear. Kathryn has designed a medium size Classic Quilted Handbag with all of the iconic details. For the first time ever Kathryn and I are going to teach a class together, so you get two very experienced sewers for the price of one! Kathryn and I have done a great deal of research into the origins of this jacket and I have based my pattern of this jacket on the original designs presented in Paris in 1950's. This class explores a C20th Classic, the quilted cardigan jacket. 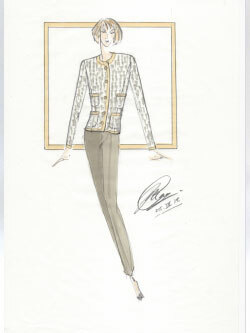 A soft, unstructured jacket in tweed, lined in crepe de chine, quilted to the lining and trimmed with braid, each element adding to the finish of the final jacket. A top London Fabric House has come up with the perfect soft tweed, which we will be offering in seven colours with a braid specially sourced for this project. This course will cover pin marking a couture pattern, trace tacking, making a three-piece sleeve, putting in a lining by hand, hand made buttonholes and so, so much more. The Gaddens Sewing School is a newly built, fully equipped studio space where all sewing tools are provided in individual sewing kits. We will create the atmosphere of a Couture Workroom with large covered tables. Students will learn hand-sewing skills as they sit together in the workroom and sew. Pure wool crepe in 56 colours including black! We can offer six single rooms and one shared room with en-suite, Full board. Breakfast, morning and afternoon breaks, as well as a hot lunch and light supper each day. On the five day workshops we will start with a welcome tea and early evening supper on Sunday prior to the workshop and there will be a farewell dinner on the Thursday evening at a top local restaurant. The three-day workshop will run over a long weekend with students arriving any time on Thursday evening, the course starting on Friday morning at 9.00am - Sunday at 5.00pm, with a celebration dinner, at Gaddens on Saturday night. We will try our best to work with any known food allergies. However, if you are on a very restricted diet, you may wish to supply your own food. Accommodation in a single room or one shared room with en-suite. Gaddens Manor Sewing School is located in the New Forest National Park, Hampshire, England. It is just over an hour from London Heathrow Airport and 20 minutes from Bournemouth and Southampton Airports. There is ample car parking at Gaddens Manor. Please visit http://www.newforestcouturesewing.co.uk/ for more information. A £600.00 DEPOSIT CONFIRMS YOUR PLACE ON EACH COURSE.